We recently visited some family and friends in Salt Lake City and were luck to have great weather to enjoy all of the natural beauty of Utah. 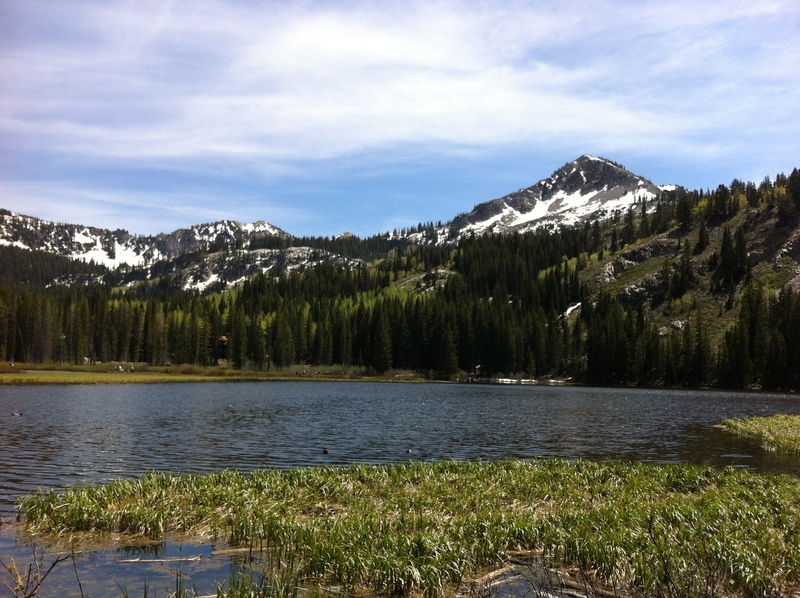 We visited Silver Lake, in the Wasatch Range south of Salt Lake City. There’s still snow in those mountains! We found a patch of snow near the trail and needless to say a snowball fight promptly ensued. The next day we took a road trip down to Moab, UT, in the southern part of the state. As we traveled further south, the landscape changed dramatically–the alpine mountain ranges disappeared and the desert appeared. It was desolate and beautiful. 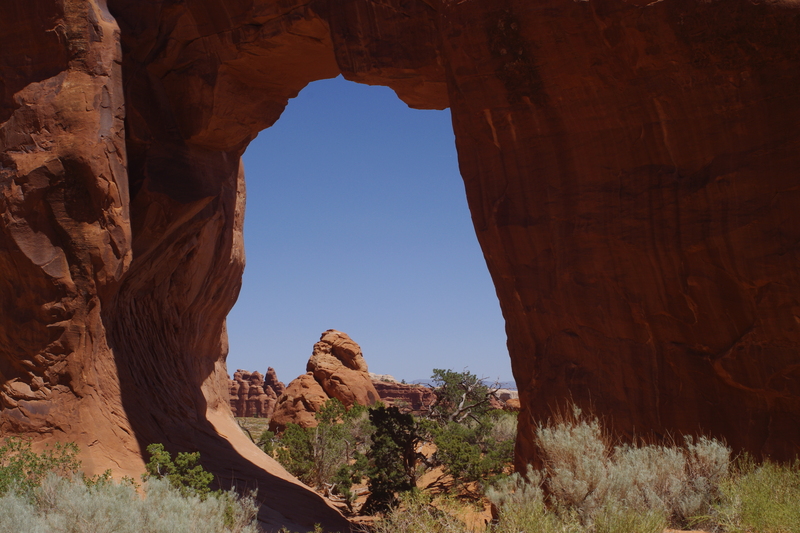 Moab is home to Arches National Park, an incredibly beautiful and otherworldly place to visit. I know our planet is ancient, but it’s easy to loose track of that living a city life. 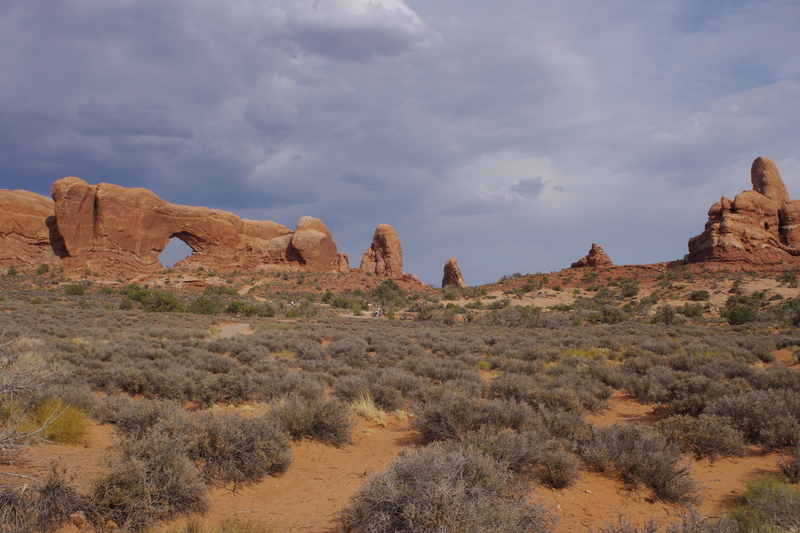 Arches National Park puts it into perspective–the spectacular rock formations were carved out by ancient rivers that have long since diminished and receded. It’s hard to imagine a time when there was enough water around to carve out this landscape. We had one hot and overcast day in the park and one gloriously-blue skyed more temperate day. If you go, please be smarter than we were and bring a cooler full of cold water. It’s so dry there it’s nearly impossible to stay hydrated. We managed, just barely, with our small supply of water, but I would have felt better with more. After a day of driving and hiking around the park, we had a fantastic dinner at Miguel’s Baja Grill. Miguel’s is basically an open-air restaurant, but it was cool and comfortable even on a hot day. Almost the entire menu is available gluten-free, and the staff is knowledgable and friendly. Their margaritas are outstanding! A quick google search located two yoga studios in Moab. Sadly, I did not have time to get a class in, but I love that such a small town can support two studios! Gluten free diners have some good options in Moab, but you still need to ask questions! Lunch at Pasta Jay’s was a bit disappointing. They have a gluten-free pizza crust, but take no special precautions to make sure the finished pizza remains gluten free (they use the same toppings and sauce that they use on their regular pizza crusts). They do have gluten-free pasta available, however, and their food is tasty (if a tad pricey–this is a tourist town, after all). Breakfast at Peace Tree Cafe was delightful. They have interesting egg options (including a green eggs and ham dish, served by our waiter, Sam) and are knowledgable about gluten free dining. They offer gluten-free bread, but they don’t have a separate toaster for it. But, they had no trouble preparing a gluten-free omelette (and really, how hard is that anyway?). Peace Tree Cafe makes delightful smoothies along with their other nice breakfast items. They’re open for lunch and dinner, also. 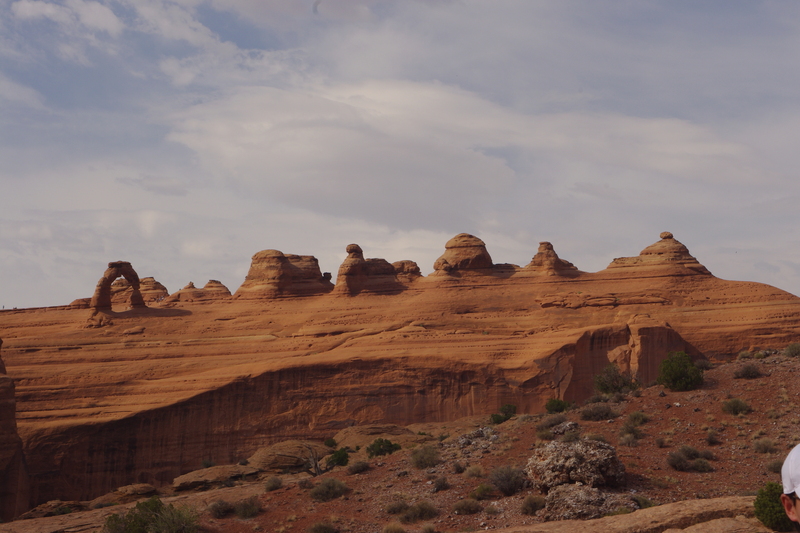 I’m looking forward to another trip to Moab, hopefully one involving bikes and some more hiking! 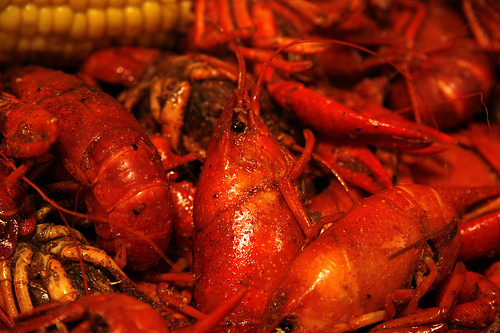 Boiled Crawfish, Grilled Oysters, Fried Plantains, oh my! I just spend the week in New Orleans, and though our beloved Casamento’s Restaurant was closed for the summer, we ate very well and gluten-free all week. Crawfish were in season, so we (happily) ate boiled crawfish probably every other day, and lots of oysters. The oysters were not as good as they were on our Christmas trip, though. 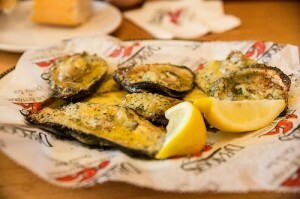 But, that didn’t seem to affect the grilled oysters we ate at Quarterview Restaurant in Metairie and Deanie’s in the French quarter. They were proof that using ample butter, garlic and cheese makes anything taste delicious! Aside from boiled crawfish (and shrimp), our best meals were at Bennachin, a tiny West African restaurant at 1212 Royal St. in the French Quarter. They don’t have a website, and I’ve been unable to find their menu online to post here. We happily dined on Jama Jama ni Makondo, a plate of tasty sauteed spinach, coconut rice and sweet fried plantains. 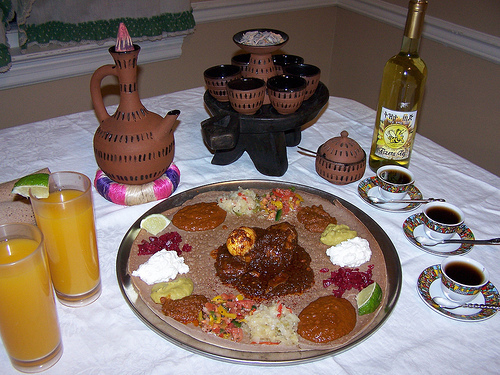 We also had the Kone ni Makondo, a tomato-based black eyed pea stew, also served with coconut rice and plantains. For desert, we had more fried plantains topped with a rich yogurt-based sauce (I think it was vanilla yogurt with some sour cream mixed in) that really knocked us out! It was delicious! If you are avoiding gluten, just make sure you tell them not to put bread on your plate (actually a good thing to do anywhere you dine in New Orleans). On a recent trip to NYC, my husband and I had the pleasure of dining at Risotteria in Greenwich Village. Risotteria is a fantastic find for anyone with dietary restrictions, be they voluntary or required by a medical condition. The serve basically 3 types of foods–pizza, paninis and risotto. I had a risotto made with a vegetarian stock and it was fabulous. My husband had a pizza and also found it delicious. Their menu simply buy clearly denotes foods that are vegetarian, non-vegetarian, gluten-free and dairy-free. We didn’t try the gluten-free pizza, but if it was anything like the gluten-free breadsticks that started the mean, I’m sure it is the best gluten-free pizza you’ll ever have. The kitchen takes all the proper precautions to keep your food from being contaminated with whatever it is you can’t have in your diet, so people on restricted diets can happily and healthily eat here. One drawback is that the place is tiny. The tables are pretty much right on top of each other, so you’re either going to be annoyed with the people dining next to you, or you might end up striking up a fun conversation, which is what we did! The restaurant is on Bleeker St., which is great for a stroll in Greenwich Village. I suspect we’ll go to this restaurant every time we go to NYC.